Figure 1. Wildlife biologist, Boyd Porter, handling an adult male mountain goat on the Cleveland Peninsula. The lower Cleveland peninsula, located north of Ketchikan, harbors a small, unique mountain goat population. The population is notable due to the particularly large horns of mountain goats in this population. According to Boone and Crockett, 4 of the 10 highest scoring mountain goats have come from this small population. Overall, the area is comprised of 9 very small patches of alpine habitat separated from the coast range mountains by 20 miles of low elevation, unsuitable mountain goat habitat. In the early 1980’s, ADF&G researchers determined that the total alpine complex was inhabited by 50-70 mountain goats with small groups living in each small alpine patch. In recent years, only 4 of the alpine patches were documented to be occupied and the overall population suspected to have declined. Precise aerial survey data from this area is lacking due to the relatively high use of forested habitats, even during summer. Further, it is unclear how much mountain goats move between each small alpine patch and, more importantly, to the larger coast range populations 20 miles to the east. If movement is limited then an extended period of time might be required for animals to re-colonize vacated alpine patches and constrain the overall population resilience and performance, a particular issue for small populations. In 2009, a small-scale research effort was initiated in order to acquire more precise estimates of population size and distribution (via mark-resight aerial surveys), acquire fine-scale movement information (via GPS radio-collars) and learn about population genetic structure. 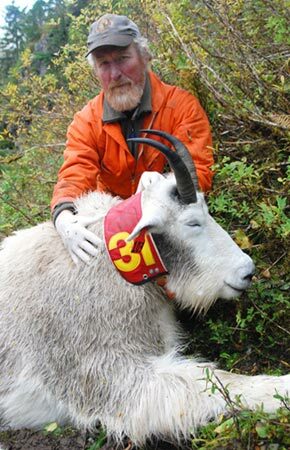 Overall, 12 mountain goats were captured and deployed with radio-collars (including 5 GPS radio-collars). In addition, morphological and genetic data were collected from captured animals. White, K. S., B. Porter and S. Bethune. 2010. 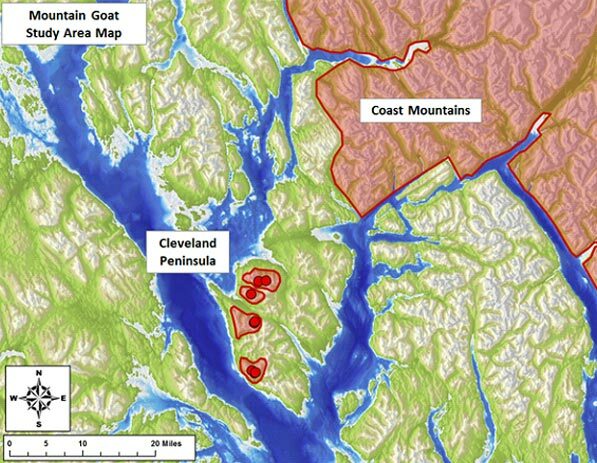 Mountain goat movement patterns and population monitoring on the Cleveland Peninsula. Research progress report. Alaska Department of Fish and Game, Juneau, AK. Figure 2. Age-specific total horn length for male mountain goats on the Cleveland Peninsula, and elsewhere in southeastern Alaska. 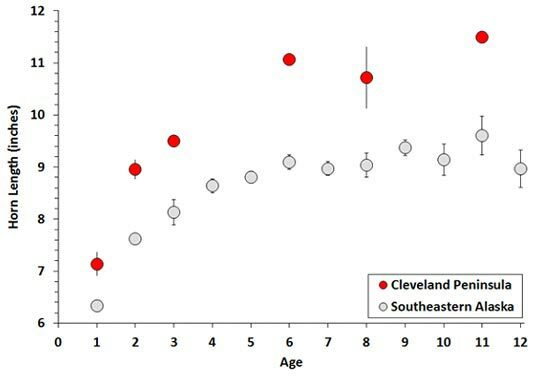 These data clearly demonstrate how mountain goat horn length on the Cleveland Peninsula is substantially larger than elsewhere. Figure 3. Map of the Cleveland Peninsula study area showing the location where mountain goats were captured.